Do you know, until very recently I’d never thought twice about mincemeat. It’s just a part of Christmas – it fills mince pies, I put it in my cheats Christmas pudding, I occasionally dive into a jar with a spoon… But at some point last year I realised that dislike for this festive staple is actually quite common, and when a friend from lands far away said it was a bit weird (there was much confusion between scotch pies and mince pie, and the difference between mincemeat and minced meat) it struck me that I’ve been in a total mincemeat bubble all my life. So before making my slow cooker mincemeat I decided to look into it and see what I could learn about it and mincepies. Now, it’ll come as little surprise that the mincemeat of ye olde days did contain meat, but somewhere throughout the centuries the addition of spices happened and the beef eventually became suet (and here vegetable suet). To show how far we’ve come, today I make both the usual small mince pie and a large mincemeat tart (which apparently is a North American take on our mini pies), but it’s not always been thus. In medieval times a ‘chewette’ (appetising sounding, right…?) could contain meat or liver – and sometimes fish, for feasting days – chopped hard boiled eggs and often ginger. 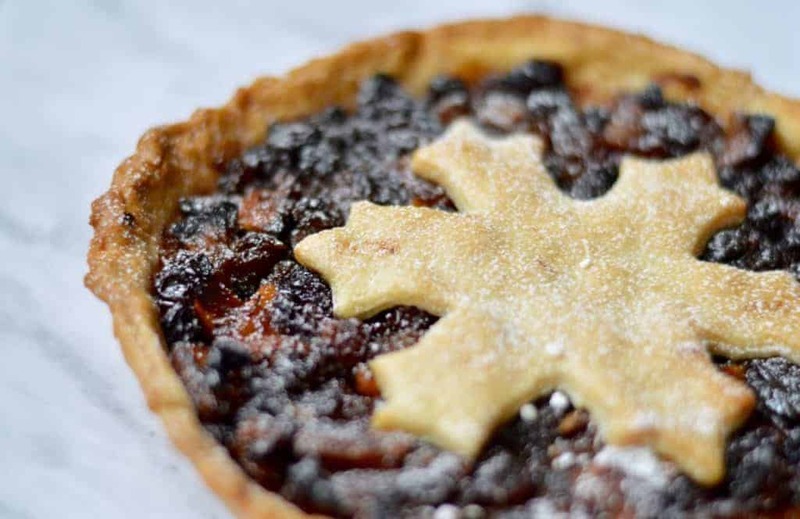 It was in the 16th century that the spices started really going in, the dubious name changed to ‘minced pies’ and they became a Christmas treat. Some time later the meat started to be switched out for suet and by Victorian times had gone for good. (As ever, thanks for my Oxford Companion to Food as my research start point). Today we find that some people find it odd, especially if they haven’t grown up with it, and whilst that’s OK, it’s really their loss. I had only ever bought mincemeat before I started using my slow cooker (yes, I made mince pies with shop-bought pastry; no I never tried to pass them off as all my own work). It takes a lot of the hassle, stirring and standing over the hob out of the equation, which in the busy festive season (or the run up to it) that can free up a bit of time for other things. 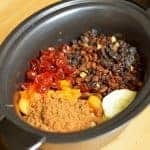 I can’t decide if it is this slow cooker mincemeat or my mulled wine that is my favourite festive slow cooker recipe, but if you have a preference, do let me know. Beyond the mince pie and mincemeat tarts there is actually quite a lot you can do with this slow cooker mincemeat. I used a chunk of mine in the Christmas pudding (yes, I make it in a microwave, so shoot me – it’s way easier), but I’ve heard of people making swiss rolls, muffins, traybakes and more. 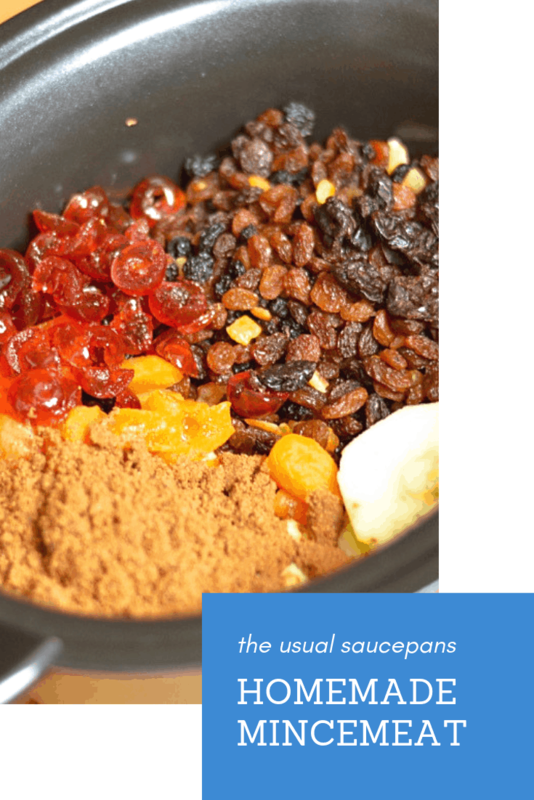 This is a great way of making your own mincemeat. It works whether you are making a couple of big jars to use in your kitchen for your own Christmas baking, or making up smaller jars to give to others. As always, the slow cooker takes a bit of time, but it’s totally worth it. 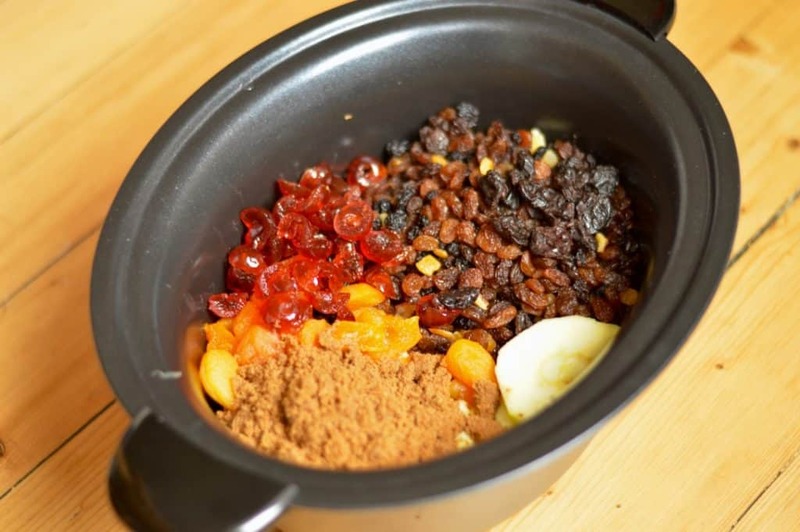 Put all your ingredients (minus about half the brandy) in the slow cooker and mix together with a wooden or silicon spoon. Cook on high for 1 hour and 15 minutes (75 minutes). Turn the slow cooker down (don’t take the lid off, it’ll affect the temperature) to low and cook for another hour and 15 minutes. About half an hour before the end, sterilise your jars. Take the lid off the slow cooker, mix through the remaining brandy and then decant into the sterilised jars. Seal securely and put in a cupboard and keep out of sunlight before use.